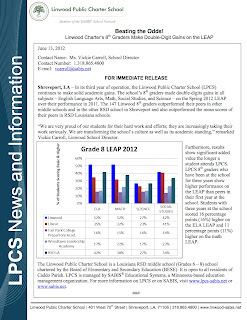 Shreveport and also outperformed the mean scores of their peers in RSD Louisiana schools. 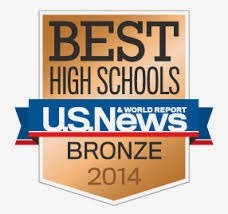 “We are very proud of our students for their hard work and efforts; they are increasingly taking their work seriously. We are transforming the school’s culture as well as its academic standing” remarked Vickie Carroll, Linwood school director. Furthermore, students in 8th Grade, who have been at Linwood for three years, show higher performance on the LEAP than their 8th grade peers who are in their first year at Linwood. They scored 16 percentage points (16%) higher on the ELA LEAP and 11 percentage points (11%) higher on the math LEAP, a strong affirmation of the value added of being at Linwood for 3 consecutive years. 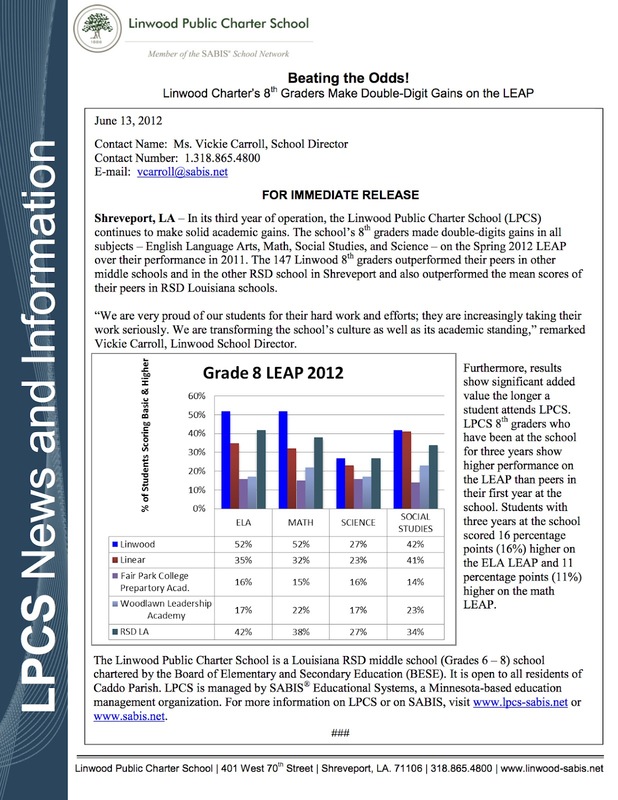 The Linwood Public Charter School is a Louisiana RSD middle school (Grades 6 – 8) school chartered by the State Board of Elementary and Secondary Education (BESE). It is open to all residents of Caddo Parish (Shreveport). LPCS is managed by SABIS® Educational Systems, a Minnesota-based education management organization. For more information on LPCS or on SABIS, visit www.lpcs-sabis.net or www.sabis.net. Go Warriors!!! I am so proud of this great accomplishment!!!! !